University of Cologne (Germany), Corvinus University of Budapest (Hungary), London School of Economics and Political Science (UK), European Institute of Public Administration (EIPA) (The Netherlands), Istituto Affari Internazionali (Italy), Swedish Institute of International Affairs (Sweden), Foundation for European Studies – European Institute Lodz (Poland), University College Dublin (Ireland), Institut für Europäische Politik (Germany), Charles University (Czech Republic), Instituto d’Estudios Estratégicos e Internacionais (Portugal), European Political Science Network (France), Universidad de Navarra (Spain), Max-Planck-Institute for Comparative Public Law and International Law (Germany), Göteborg University (Sweden), Institute for International Relations (Croatia), Fondation Nationale des Sciences Politique (France), The Federal Trust for Education and Research (UK), University of Wales (Wales), University of Tartu (Estonia), Trans European Policy Studies Association (TEPSA) (Belgium), Middle East Technical University (Center for European Studies), Centre for European Policy Studies (CEPS) (Belgium), College of Europe (Belgium), University of Cambridge (UK), Zentrum für Europäische Wirtschafts-forschung (Germany), Institute for World Economics (Humgary), University of Pau et des Pays de l’Adour (France), Latvian Institute of International Affairs (Latvia), University of Duisburg-Essen (Germany), Austrian Institute for International Affairs (Austria), Stiftung für Wissenschaft und Politik (Germany), University of Cyprus (Cyprus), Warsaw School of Economics (Poland), University of Sussex (UK), University of Vienna (Austria), Bulgarian European Community Studies Association (Bulgaria), University of Edinburgh (UK), Netherlands Institute of International Relations “Clingendael” (The Netherlands), Università degli Studi di Trento (Italy), Centre Francais de recherché en Sciences Sociales de Prague (Czech Republic), University of Bratislava (Slovakia), University of Ljubljana (Slovenia), Universidad Nacional de Educación a Distancia (Spain), Hellenic Foundation for European and Foreign Policy (ELIAMEP) (Greece), Finnish Institute of International Affairs (Finland), Bosporus University (Turkey), Centro Interdipartimentale di Ricerche sul Diritto delle Comunità Europee (Italy), Danish Institute for International Studies (Denmark), Greek Centre of European Studies & Research (EKEME) (Greece), University of Potsdam (Germany), Stockholm International Peace Research Institute (Sweden). 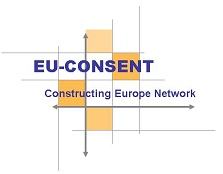 EU-CONSENT is a network of excellence for joint research and education that analyses the construction of a new Europe over the period between 2005 and 2008. It addresses the question of the mutually reinforcing effects of deepening and widening by developing and working with three sets of expectations concerning past and future integration of Europe. Within this conceptual framework, 25 teams draw from past experience and its academic and political validity in order to discuss visions and scenarios for the future. The leitmotiv running through the project is that the Union is in a process of reinvention – a development which is however difficult to grasp and explain. The common framework includes integrating activities (conferences, workshops and activities), common research (EU-25 Watch, WEBCONSENT), teaching (traditional courses, virtual study units on EU deepening and widening, a PhD Centre of Excellence and internships for young researchers) and dissemination activities (public events and common publications). Research and activity results flow into common databases such as the E-Library, a multilingual glossary on EU deepening and widening, bibliographies and core curricula, which are all available on the CONSENT-WEB. It also provides yardsticks for observing the progress made by the entire project. The open character of the network, which aims to be a “network of networks”, together with the inclusion of young researchers into the network, respect of gender equality and concern for sustainability, are the core principles of EU-CONSENT. Its management is based on a consolidated structure, following a decentralised approach. As an academic and policy-oriented network, EU-CONSENT is closely linked to decision-makers at EU and national levels as well as to civil society. On 26 and 27 March 2009 the Network of Excellence EU-CONSENT met for the fourth time at its Plenary Conference in Brussels. This event marked the conclusion of four years of successful networking and joint research. Once again almost every EU-CONSENT partner institute was represented and researchers from the network seized the opportunity to discuss past activities and in light of the sustainability mandate plan future joint co-operation. The plenary conference began with the General Assembly in which the project and financial manager Funda Tekin reflected on the strength and weaknesses of this Network of Excellences from which she drew lessons for the fourth and final reporting (her presentation can be found on the internal part of EU CONSENT’s website (www.eu-consent.net). Moreover, Gunilla Herolf and Wolfgang Wessels presented dissemination results and ideas for sustainable network structures. Once again the General Assembly provided the framework for awarding the three winners of the EU-CONSENT PhD Award 2009. Attila Agh (leader of the EU-CONSENT PhD Centre) congratulated Flavia Zanon (first price), Simone Weske (second price) and David Cadier (third price) to their successful papers and their contribution to EUCONSENT’s concluding PhD Market in February 2009. The General Assembly was followed by the traditional lunchtime debate moderated by Iain Begg. This year two teams – consisting of one PhD student and one senior researcher – debated the motion “Achieving a Coherent European Energy Policy will be the litmus test of further EU Integration”. The opponents to this motion were able to convince some researchers to change their minds and thus it was agreed that even though Energy Policy is among the most essential European Policies it shall be doubted whether it can be considered the litmus test for further EU integration. Each of EU-CONSENT’s thematic Work Packages had the opportunity to meet during the afternoon of the first day of the conference. Some work packages organized interesting roundtables others gathered in order to discuss and reflect upon their research results of the past four years. Thursday evening Alyson Bailes gave the EU-CONSENT Annual Lecture and presented her analysis and assessment of “The EU in/and crisis”. The second day of the conference targeted the presentation and in depth discussion of EU-CONSENT’s research results. Gaby Umbach presented a synergy paper that compiled answers from EU-CONSENT researchers to a questionnaire. This presentation was followed by some conclusions that Wolfgang Wessels drew from four years of joint research. These two presentations were commented by researchers representing the different thematic foci of the Network of multi-disciplinary approach of EU-CONSENT that was needed in order to integrate more than 50 partner institutes into the European Research Area. The conference was concluded by a roundtable discussing with the European Commission and the new president of ECSA world sustainability options for EU- CONSENT. EU-CONSENT’s Concluding Plenary Conference provided the perfect opportunity to reflect upon the past activities to which posters presenting the results of the different work packages added. Even though the plenary conference marked the concluding event there are still lots of interesting activities to come in the remaining two months of project lifetime: e.g. the concluding Work Package conference on “Deepening and Widening in the specific case of the Euroean foreign, security and defence policy” (Cambridge, 16-17 April 2009); a seminar on “Economic and social governance in the making: EU economic governance in the flux” (Bruges, 7-8 April 2009); a conference on “EU Governance in Crisis” (Brussels, 7 May 2009); and the Swedish Pre-Presidency Conference (Stockholm, 28-29 May 2009) – only to name a few. If you are interested in participating you are certainly invited to visit the EU-CONSENT website (http://www.eu-consent.net) to access further information.